Kick scooters for kids are a fun way to get around quickly. They are kid powered and that means great outdoor exercise for kids. Your little ones get where they’re going quickly and safely, they burn some energy and they have fun. This is indeed a winning combination. No kids should be left behind when it comes to school or friends and having the latest toy or fad is a status symbol for the kids. Scooters are it, and there are some great choices. 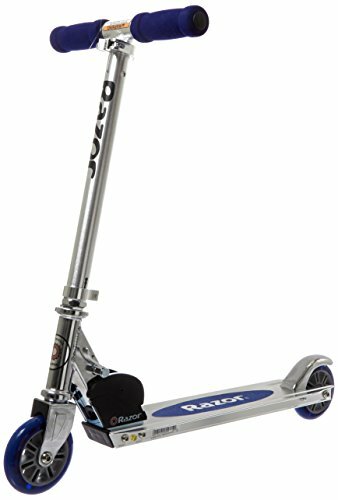 Razor kick scooters are the name brand and this one comes in multiple colors and is recommended for ages 5 and older. The wheels are 98 mm inline-style urethane with ABEC 5 bearings and these scooters have a patented T-tube and deck design that conveniently folds for travel and easy storage. It only weighs six pounds and comes with a patented rear fender brake for safe and quick stops. The one pictured has blue highlights and this Razor model is made of sturdy aircraft-grade aluminum. Superior quality and durability in this Swiss designed Micro Max kick scooter. 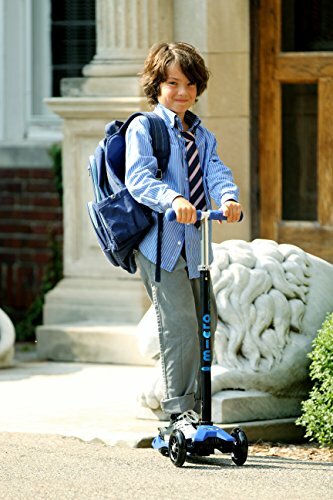 This is a great scooter for kids between the ages of five and twelve. Double front wheels and a T-Bar design make this one a safe bet with learn to steer technology. Works best and is perfect for Urban/Suburban pavements with its high quality PU wheels. Smooth and safe riding with this scooter from Micro. This scooter is like being on a skateboard but with greater control and maneuverability. The handlebar styles are interchangeable as an accessory. Traditional T-Bar for easy balancing or the Joysstick for better curving and carving. This scooter is awesome and affordable fun. It makes a great gift for elementary school aged kids. 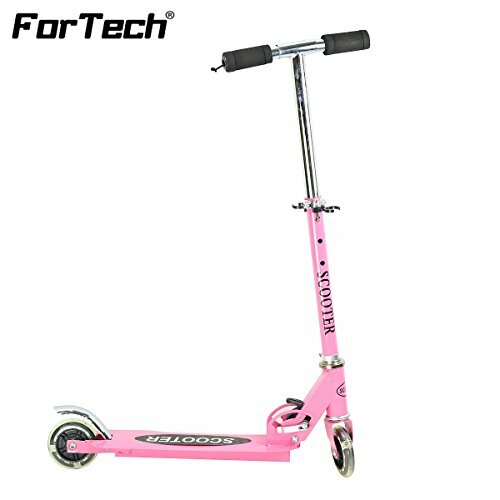 FORTECH makes a great kick scooter. It is the perfect toy for kids and this one is for young kids with a maximum weight of 120 lbs. Choose the suitable height for your kids with the non-slip and adjustable handle bar. This scooter can be an affordable gift that is loads of fun. It is space saving with an easy folding system and its convenient for travel. Convenient for bus or car with the fast fold design. It weighs under seven pounds with double rear wheels for a smooth and controlled ride. It is built of sturdy grade A aluminum and will last for years. This hot pink scooter is a real looker and status symbol and it is also great exercise and fun. This is a starter three in one scooter for little kids with a maximum weight of 66 pounds. Perfect for kids between two and five years. It includes a super rear wheel for extra stability and a built in raised grip surface on the scooter deck. It has an easy to use rear brake and a light weight aluminum handlebar. 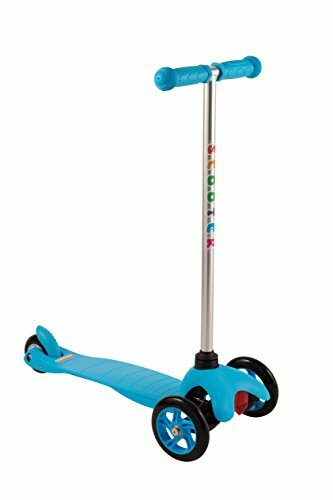 This is great for kids to help them learn to balance when scooting with its wide deck, and practical learn to steer three wheel design. This is an affordable way to go because it is a toy that grows with your child. Switch from the seat with small handlebar to the long handlebar for different levels of safety and abilities. Indoor and outdoor use with this fun riding toy for kids.